Here you will find books, videos and training materials in several languages to aid in the installation and continued support of TPM users. Written in an easy to understand manner, our materials should be clearly understood and useful. TPM Press has also printed and delivered at least 10 different types of training manuals and over 1,800,000 pages of training materials. These manuals are currently designed specifically for our training and installation clients, as well as our seminar participants. While they are not available for sale here, they are a large part of TPM Press and the International TPM Institute knowledge base. Items listed below can be ordered through Paypal, which allows for secure payment by credit card, EC Karte (Germany) and bank transfer (*options may vary across countries). Prices are listed in USD, and approximate shipping charges will be added at checkout. 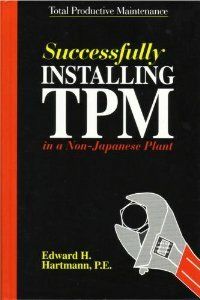 Successfully Installing TPM in a Non-Japanese Plant by Edward H. Hartmann (English, 2000, hardcover). The second edition of the worldwide bestseller, it was the first book on TPM written by a non-Japanese author for a Western audience. 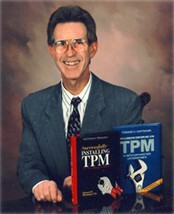 It has become the “bible” for successful “Western” TPM installations in Germany, the United States and Latin America. This book is available in English hardcover (as shown here), German hardcover and Spanish softcover. To buy the German eBook or hardcover, Effiziente Instandhaltung und Maschinenmanagement, go to Vahlen.de. Shipping Weight: 1.8 lbs. approx. *Shipping prices vary depending upon destination and shipping services available. Our listed shipping rates are approximate, and could change. We have tried to list the least expensive shipping options available. The TPM Video Course: How to Successfully Install TPM in your Plant by Edward H. Hartmann, is a 7-part video series with manual (in English & Spanish). This 11-hour, 7-part video course is based on Ed Hartmann’s seminars, and is delivered with a 200-page manual. It is most often used for in-house training and purchased by companies training small groups of employees in the various steps of TPM. Shipping Weight: 2 lbs. approx. 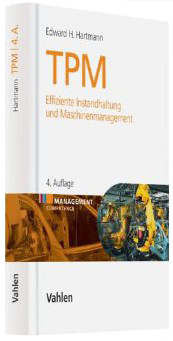 TPM, Effiziente Instandhaltung und Maschinenmanagement by Edward H. Hartmann (2013, in German). The 4th, and most recent edition of Successfully Installing TPM in a Non Japanese Plant, is currently available in German in hardcopy and PDF formats, at Vahlen.de. This book is used in all TPM Institute seminars and trainings in Germany, Switzerland and Austria.